Here you can see some of my already sold sets as well as custom sets I have done. These sets are NOT for sale as they have already been sold. These are some of the different works that I have done. Each set I have done maybe similar in style each is unique in its own way. If you are wanting something custom made I can do it. I have many charms to choose from as well as I can order others but ordering does take time to get them sometimes up to a month depending on where it will be coming from. When ordering a custom set or piece please indicate the color/s of beads wanted used and if you would like a charm included in the piece or set. Custom pieces have a slightly higher price than those that are shown finished. Please contact me for more information. Thank you. This was a custom set ordered. 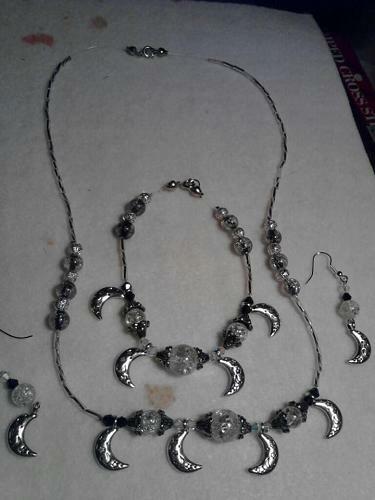 they asked for black silver and white beads with the crescent moon charm.